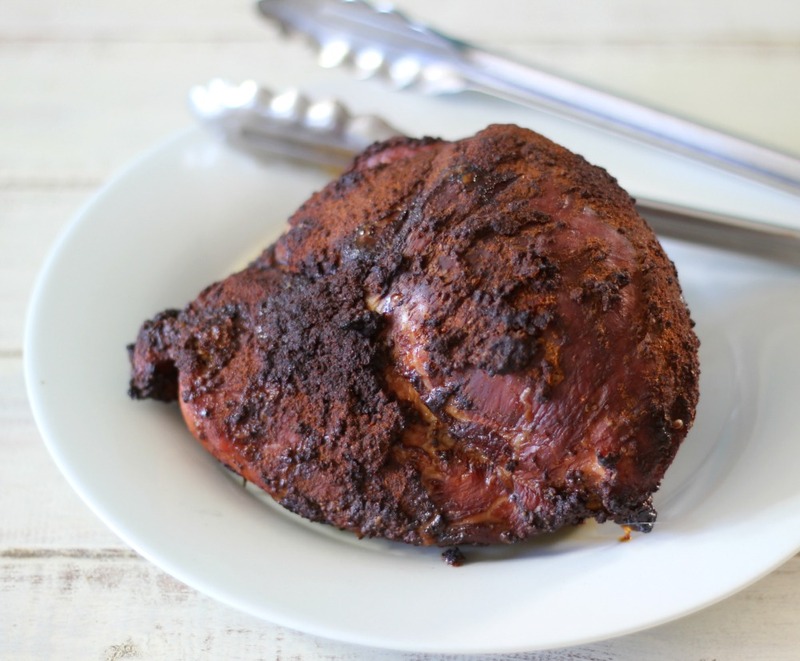 Today I have a wonderful, simple Smoked Pork Sirloin Tip Roast recipe that is perfect for a weekend dinner or perfect for your next tailgating party. 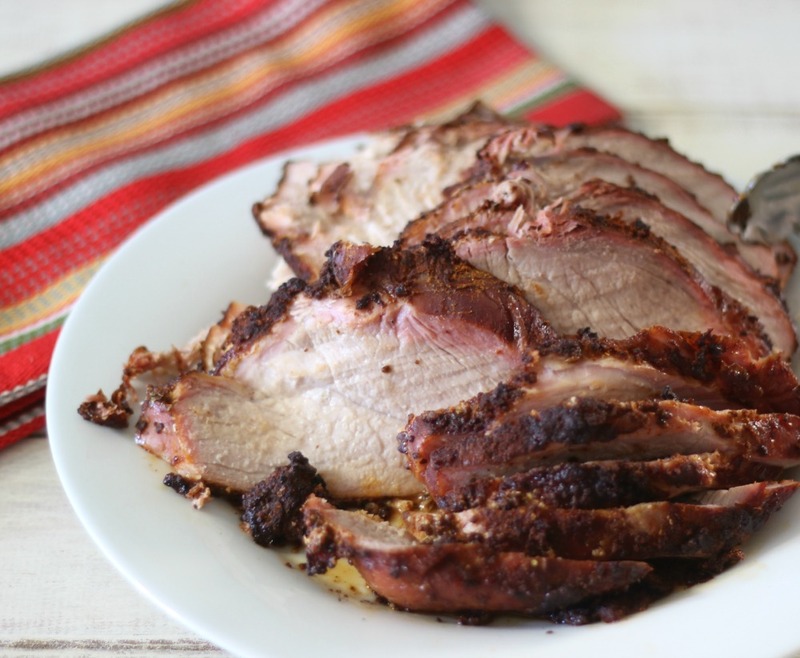 It is simply scrumptious, moist, delicious and the flavor is a mix between pork tenderloin and bacon. We just loved it and I hope you will too. 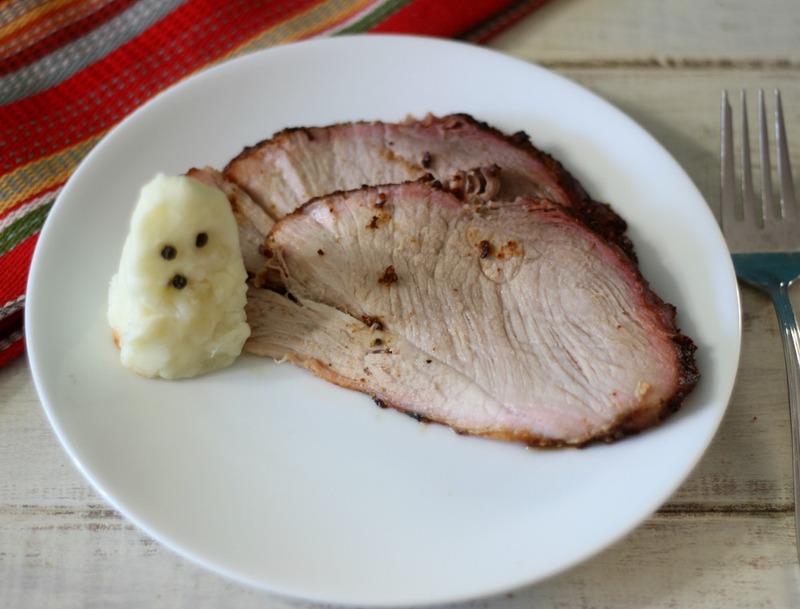 We purchased our pork sirloin tip roast from Costco. It comes in a 4 pack and the whole packaged weighed a little over 7lbs and was only $22.00. That’s a pretty good price so we thought we would give it a try. To our surprise we simply loved it. 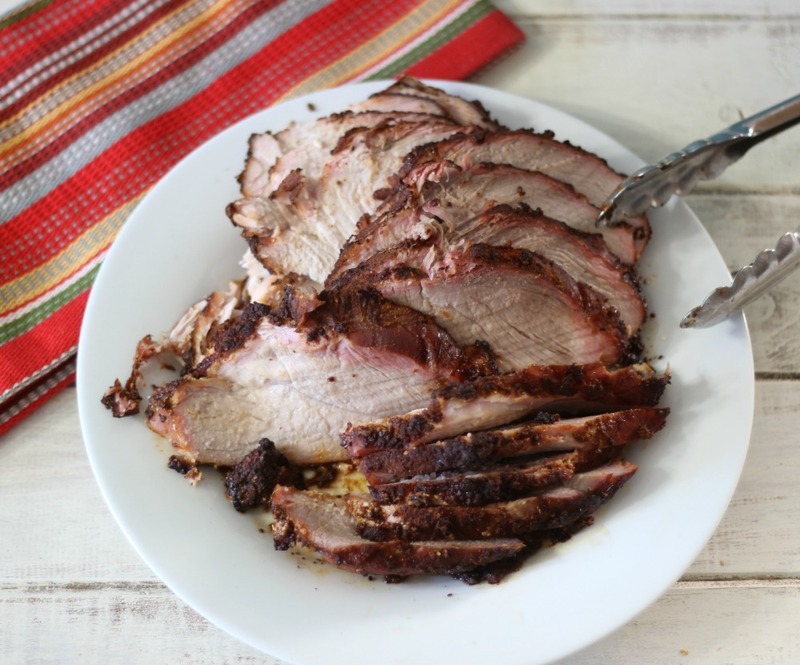 I honestly never heard of a pork sirloin tip roast, but now that we have tried it, we will be buying it up. I’m glad I have 3 more recipes to make with it. To make the recipe, the night before we rubbed dijon mustard over the roast, then I added my favorite Carolina Rub on it and let it sit overnight in the refrigerator. You can use any kind of rub you desire, but I recommend a sweet rub. The next day, we brought it out of the fridge and let it come to room temperature while we prepared the grill. To make a smoker, what we did was use our charcoal grill. We heated up our coals, and then pushed them to one side of the grill. Placed the pork onto the side of the grill without the charcoal and let it sit there and smoke for about 3 hours. A rule of thumb is about an hour per pound and my pork was roughly 2 1/2 pounds. Once the pork reached 150 degrees, we took it off and let it rest for 20 minutes before cutting. You do this so the juices run back into the meat. 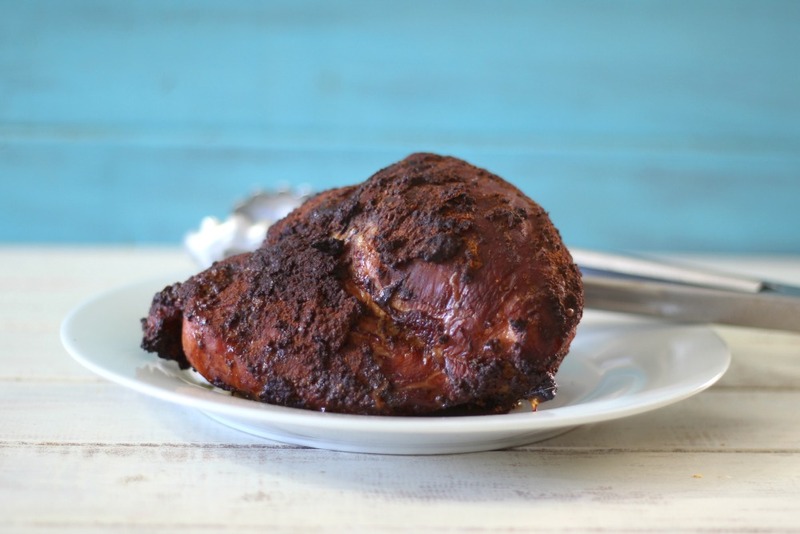 Tender, juicy, melt in your mouth easy smoked pork that is perfect for sandwiches and parties. The night before, rub mustard all over roast and generously sprinkle with your rub. I used about ¼ cup. Cover and refrigerate over night. The next day take the pork out and let it come to room temperature. Meanwhile, start your charcoal grill. Let it heat up high and once the fire calms down, move the coals to one side of the grill. Place the pork on the side of the grill without the charcoal. Cover the grill and cook until the pork reaches 150 degrees (about 3 hours). Take the pork off the grill and cover for 20 minutes so the juice runs back into the meat. Cut into slices and serve. I think this recipe would just be perfect to cook up this weekend. I am personally a fan of a charcoal grill when it comes to meat, however you can use the same concept using a gas grill. This is almost exactly the same recipe I use, and it always turn out perfectly. Don’t you just love this kind of recipe. The flavor is just amazing!! Do you know about what temperature you’re cooking at? I have a smoker so I’m just curious. Hi Alec, You are lucky to have a smoker. I am not sure of the temperature. I asked my Husband and he guesses between 250 – 300 degrees. We just kept the coals hot and let it sit. Sorry, i am not much help on this. I guess I should get a thermometer for the grill.